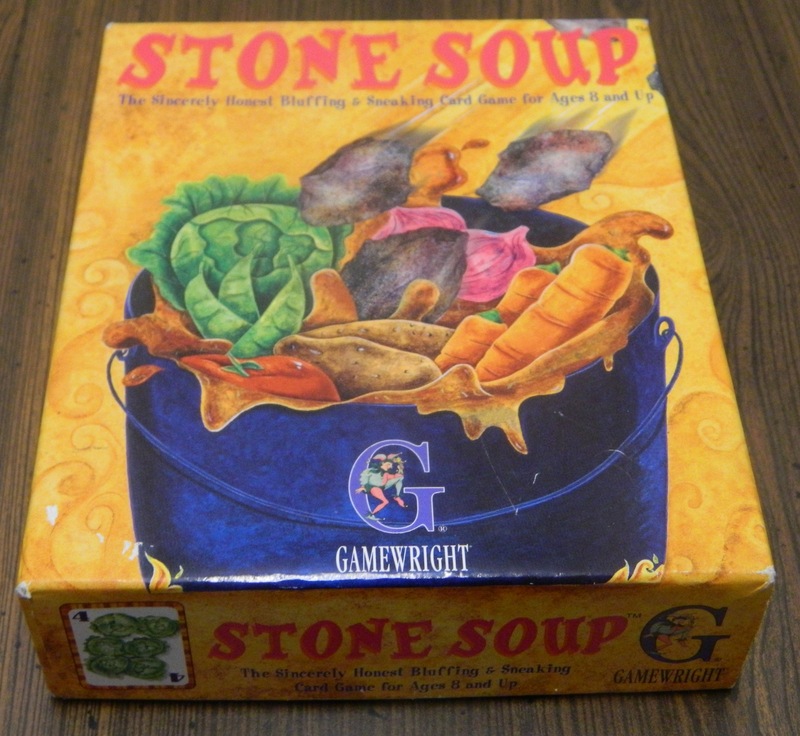 In the past I have reviewed quite a few different Gamewright games here on Geeky Hobbies. 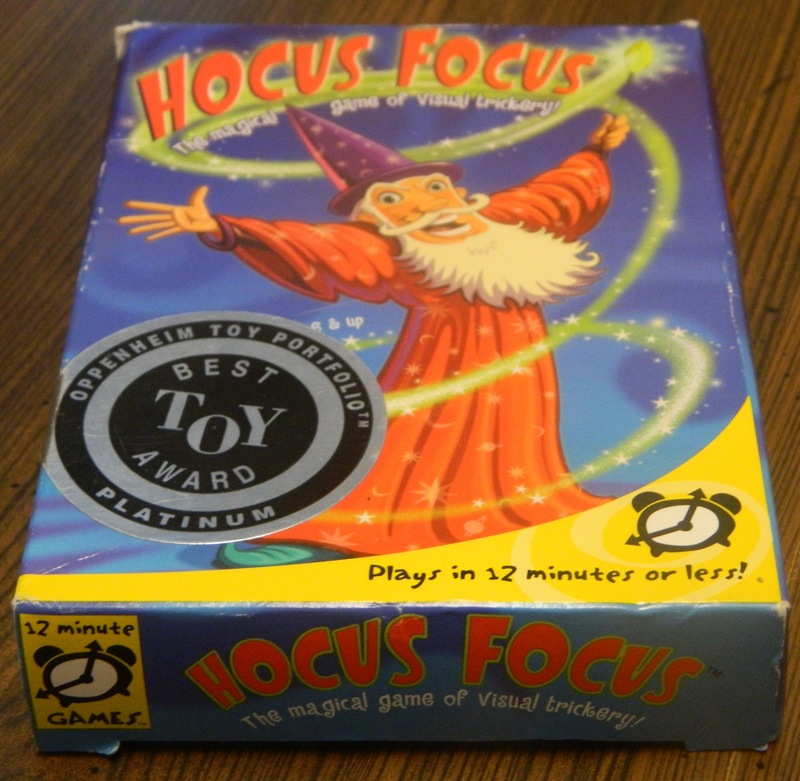 Being a company that makes both family and children’s games, I have found their games to be kind of hit or miss. I have really enjoyed some of their games that were made for older children and families (Sushi Go, Dragonwood). On the other hand the games that were made for younger children haven’t really appealed to me which is to be expected. With today’s game being from the latter group I was interested in seeing how it would turn out. Unfortunately TaraDiddle! (also known as Pinocchio) has some broken mechanics which makes it not appeal to anyone other than younger children. Separate the nose and player faces from the rest of the cards. Each player chooses a face card. Shuffle all of the clothes cards and equally deal out cards to all of the players. Any extra cards are removed from the game. Each player keeps the cards they were dealt face down in a stack in front of them. The youngest player gets to go first. On a player’s turn they will draw the top card from their pile. They will play the card face down and say what card they played (piece of clothing and color) without showing the other players the card. When playing a card, the card has to either match the color or type of clothing of the last played card. 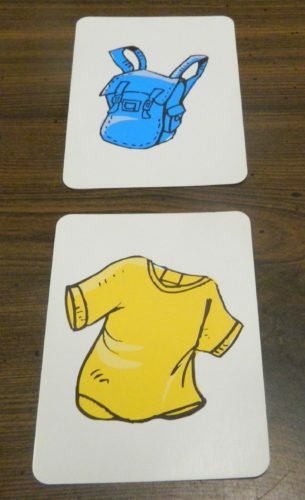 If the color or type of clothing matches the last card played, the player plays the card and tells the truth. The top card was the last card that was played. 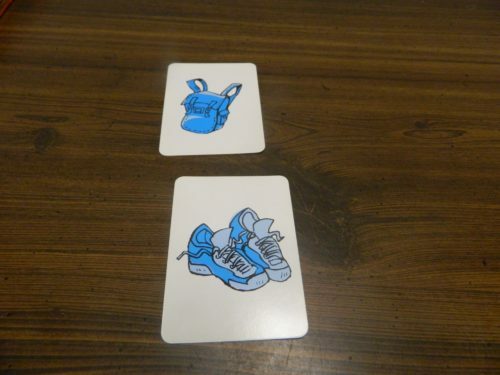 Since the next player’s card is blue shoes they can play the card without bluffing since it matches the color of the previously played card. Note: The cards are played face up for illustrative purposes. 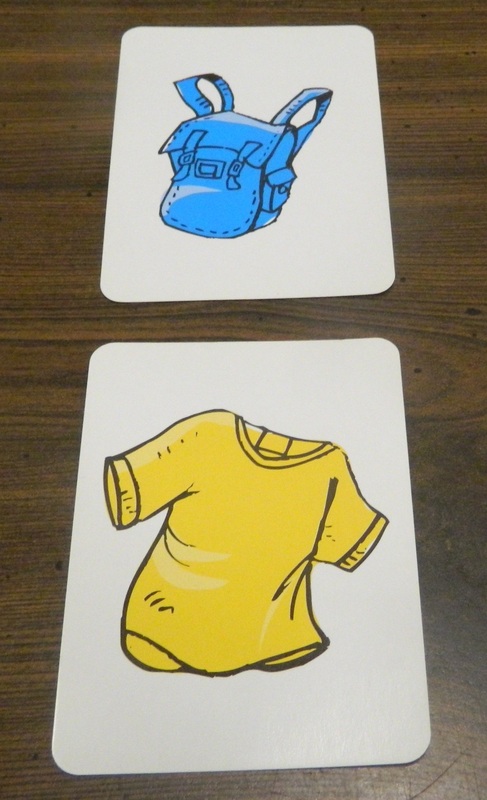 If the player’s card does not match the color or piece of clothing, the player has to make up what card they played. The most recently played card is a blue backpack. The next player’s card is a yellow shirt. Since it doesn’t match the type of clothing or the color of the previously played clothing item, the player will have to bluff. Some potential bluffs include a blue shirt or a yellow backpack. Note: For illustrative purposes the cards are face up instead of face down like they would be in the actual game. The other players then need to decide if the player told the truth or lied. If no one calls out the player for lying, play passes to the next player. If any of the players think the player lied, they can call them out. If the player is called out for lying they must show the card they played. 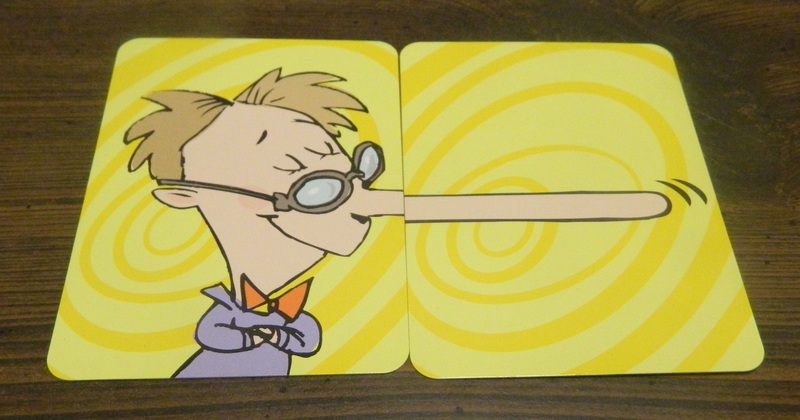 If the player was telling the truth, the player who challenged them takes a nose card. If the player was lying, the player who played the card takes a nose card. The current player’s turn is now over. The next player will have to play based on the card that was flipped over. This player was either caught bluffing or incorrectly called another player out for bluffing. The game ends when everyone has played all of their cards. Players count up all of their nose cards. 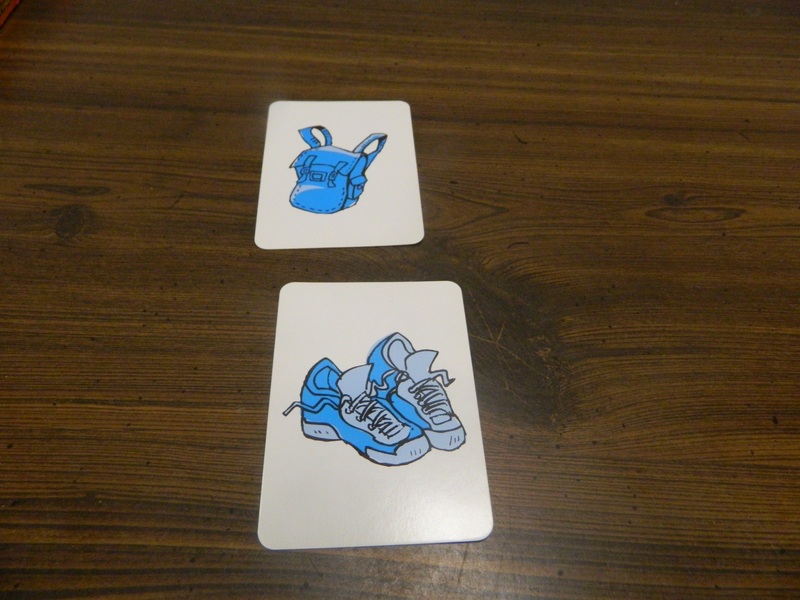 The player who has acquired the least nose cards wins the game. The bottom player has acquired the least nose cards and has won the game. While TaraDiddle! 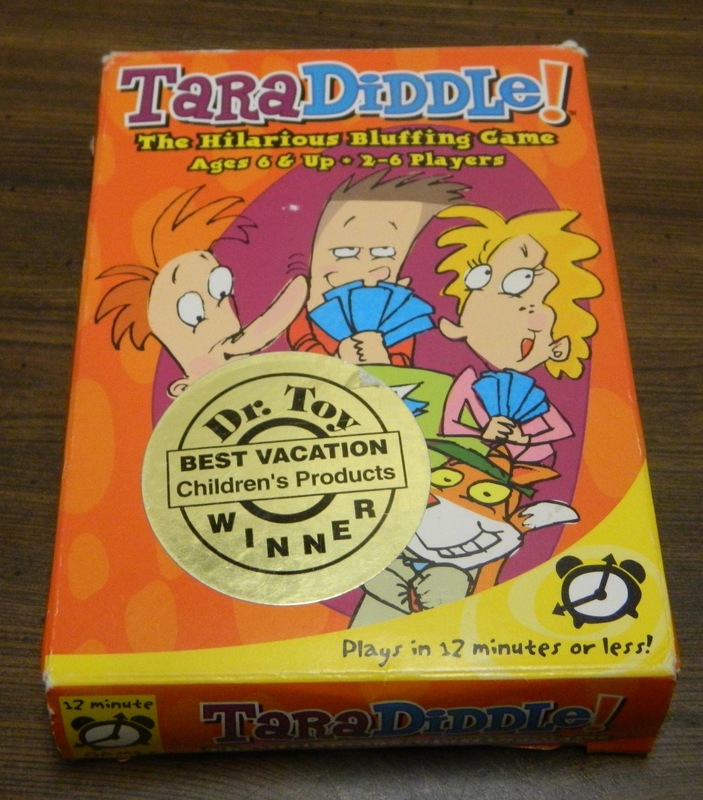 goes under the name of TaraDiddle! and Pinocchio I think a better name would be Lie Detector The Game. Basically the whole game relies on being able to lie and detect when other players are lying. All you do in the game is look at the top card in your pile. If it matches the color or clothing item of the previous card, you play the card and tell the truth. If the card doesn’t match the color or clothing you lie and name a card that matches the color or type of clothing. Then the rest of the players have to decide whether you are lying or telling the truth. That is basically all you do in TaraDiddle!. While people will have varying opinions, I don’t know how I feel about a young children’s game which basically rewards you for being a good liar and figuring out when other players are lying. 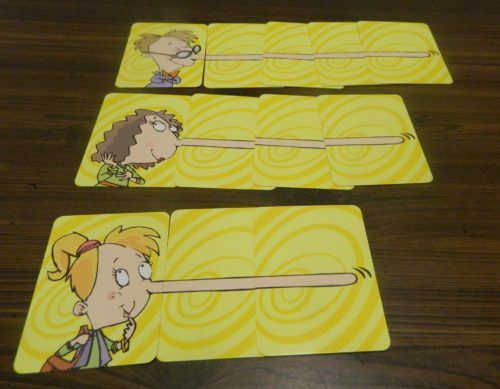 While I am not going to say that you shouldn’t teach children to lie/bluff, I think the game could have added another mechanic that didn’t focus entirely on lying. Outside of recognizing the clothing and colors, there is nothing to the game other than lying. The game doesn’t even give you an option of not lying since you have to lie if your card doesn’t match the previously played card. Unless our group was just really unlucky TaraDiddle! actually forces you to lie quite often. As a matter of fact players had to lie so often in the game that we ran out of nose cards (30 nose cards are included in the game). While some of these cards were used because someone incorrectly called out another player, most of them were given out to a player who was caught lying. It felt like we had to lie about 60-70% of the time. This meant that being able to bluff well wasn’t very helpful since a lot of times players just called out other players since they more than likely were lying. Basically your success in TaraDiddle! comes down to two things. Players who are good at lying or catching people lying will have a slight advantage in the game. Being dealt the right cards is much more important though. The player who is forced to lie the least will likely win the game. Since you have no control over what card you play on your turn, you can’t do anything to change this fact either outside of lying better. This basically leads to the biggest problem that I have with TaraDiddle! which is that you have so little control in the game. Since you don’t get to choose which card you are going to play, your decision on whether to lie or not is determined by the game. Get lucky and get a card that you can tell the truth about and you can’t lose anything by playing it. Get a card that you have to lie about and you either need to be a convincing liar or you will have to draw a nose card. What I don’t understand is why TaraDiddle! couldn’t have given players a few choices on their turn. Just letting players have multiple cards in their hand would have improved the game since it would have given players a choice. This might have made the game easier but it can’t be any worse than the alternative. I really don’t like when games give you so little control over your fate. While I don’t really fit the target demo for TaraDiddle!, I still can’t say it is a good game. I will admit that younger children will probably enjoy the game considerably more than I did but that doesn’t forgive the game’s faults. 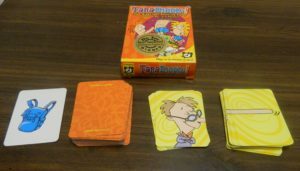 The game is easy to pick up and play which is good for younger children. The game also plays quickly which is a positive. The game has problems though and I don’t know if any house rules could fix them. It shouldn’t come as a surprise but I didn’t like TaraDiddle!. The problem with the game is that there is very little to the actual game. Basically you flip over a card and say what it is or lie about what it is. There is no strategy to the game as you don’t get to make any decisions in the game. The game forces you to lie or tell the truth based on the card you drew. This means that the game basically comes down to who can lie/catch other liars and who is fortunate enough to get the most cards that they can tell the truth with. All of these problems just lead to a very dull game. I have a hard time recommending TaraDiddle!. If you don’t have young children I see no reason why you would want to play the game since there are much better bluffing games. If you have young children and want an easy to play bluffing game, you could maybe get a little out of the game. I would only consider picking up TaraDiddle! though if you can get a really good deal on it. May appeal to young children. Has no strategy and basically comes down to luck. Gives you no choices on whether to lie or not.